Yves Saint Laurent L'Homme debuted in 2006 and has been a best-seller ever since; it is one of many fragrances that prove I do NOT have my finger on the pulse of the perfume-buying public. (L'Homme bores me.) I even nodded off as I read L'Homme's notes list: bergamot, calone, ginger, basil, cedar, violet leaf, vetiver and tonka bean. I predicted, accurately, that L'Homme's basil and ginger would be negligible and its bergamot, violet leaf and tonka would dominate. L'Homme was created by the triumvirate of Anne Flipo, Pierre Wargnye and Dominique Ropion. L'Homme starts with warm (lightly gingered) bergamot and ozone, and it moves rapidly into (light) green territory (a touch of violet leaf). L'Homme ends comfortably on a plump cushion of amber-cedar-vanilla/tonka. L'Homme smells like standard-issue men's perfume. Newly released La Nuit de L'Homme is L'Homme on estrogen-steroids, and it contains bergamot, lavender, vetiver, CARDAMOM! CEDAR! and COUMARIN! I have written about being smothered by perfume before (and I hate to repeat myself), but La Nuit de L'Homme overwhelms me with its ambery-vanillic sweetness. As I wore La Nuit de L'Homme (by the same perfume team that created L'Homme), I imagined an Oscar Wilde figure — big-boned, wearing a tuxedo and fur-lined cape, his cheeks rouged, his hair unnaturally blackened — hosing me down with his adored La Nuit de L'Homme as I gasped, gagged and screamed: "MERCY! HAVE MERCY ON MY NOSE!" If the Oscar Wilde image does not resonate for you, go to your local Sephora store, stand at its entrance, and breathe in the air from its exhaust system: the synthetic, cloying and banal amber-vanilla-floral fumes smell just like La Nuit de L'Homme. Unfortunately, women can easily wear La Nuit de L'Homme (increasing the chances of coming into contact with this deadly concoction), but, women (and men), I beg: "Don't!" Yves Saint Laurent L'Homme and La Nuit de L'Homme are available in 40, 60 and 100 ml Eau de Toilette. But did you like this one Kevin? HA! When will they ever stop making these boring men’s fragrances? You know what, I’ll answer my own question…when the puplic stops buying them! Oh dear. You’ve certainly written vividly about Nuit de l’Homme, K. No wonder I stay away from the Macy’s fragrance counters. “Standard issue men’s perfume” is not a ringing endorsement, is it? Still, if it’s a best seller, I feel obligated to test it and roll my eyes. Where does one find the best seller information, anyway? What we’re really curious about is: What’s Kevin wearing frequently this Spring? Joe: I’m wearing SAMPLES this spring (a new one each day with a huge backlog)…no time for my orphaned perfumes so far. Unfortunately it seems that in men’s perfumery it is often a choice between the “Oscar Wilde” image or the “over-sexed-alpha-male-gym-addicted-23yrs boy/man- with an 18 inch…waist” image. Platinum: there’s “shame” enough to go around…things we love are always despised by SOMEone! Can I help it if I like Silver Mountain Water…reformulated, no less, Mitsouko…Eternity for Men? HA! Kevin, did you found La Nuit more boring than L’Homme? 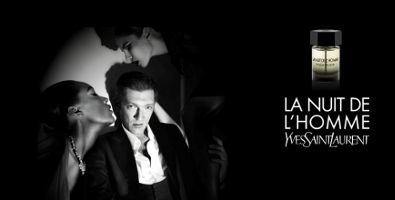 I’ve read another reviews saying that La Nuit achieves to be even more conventional than the original L’Homme. I tried L’Homme when it launched, and the only thing that I’ve remembered is being sad for presencing the death of a greath perfumehouse. Sadly, but after that common thing that was L’Homme i don’t think YSl will ever launch another M7, Kouros, Body Kouros or Opium someday. a powerhouse…I can’t see it being as popular as L’Homme (with men anyway)…but what do I know?! A boring powerhouse? Wow, that’s new to me rsrs I thought that only the light ones were boring. Ysl achieved a boring powerhouse? Shame on you YSL! Rick: By “powerhouse” I meant a perfume you can’t scrub off your skin…it clings…it saps your strength…it becomes more obnoxious and strong by the second. In this meaning, this is a rarity so. I have an impression that every fragrance made today is meant to be just a so light trail after 3-4 hours that you have to apply a lot of them just to get a great sillage and longevity. Kevin, it was you that loved Amen Pure Coffee, don’t? Did you saw that this year they’ll launch Amen Pure Malt? I hope that this is as good as the Pure Coffee flanker. I hope so too…keeping my fingers crossed. Wait… that’s seriously not a joke? Pure MALT? To be adolescent: WTF?! Ok… I’ve finished googling. Malt as in Scotch, not Ovaltine. But still. Name FAIL. I don’t think I’ve ever read a review of yours giving such a level of aversion to a scent! HA! I was actually wondering if someone hijacked your username. You even splat mistaken gender identity proclaiming it a She-He scent! WOW! I think YSL is back in the game with busting boundaries again and embracing the concept of sexual dualities. That is a step in the right direction (and no, I am not a drag queen!) . I do admit though that I’ve been playing on the other side of the fragrance counter because I’ve been liking woody-florals and they know how to do amber-vanillas and orientals there. Saying COUMARIN is like a cattle call for me! LOL! I’m curious on how bad it is. I’ve been wanting a shocker lately–I think Fleur du Male was the last time I exclaimed OMG! iMav: FdM seems “light” compared to La Nuit on me…it crushed me. Ah yes, clearly you have not read Kevin’s recipe for ‘All Hallows Eve SlopPot-pourri’ —probably my most favorite perfume review of all time. I cackle warmly just thinking of it. Daisy: Serge got a BIG response from me that day! Hi Kevin, I really enjoy your reviews and found some good ones thanks to you. But recently, it seems (I could be mistaken, though) that you review stuff that either bores you or that you despise .. could you do some reviews of scents that you like? There must be some ..
arvind: I try and review the top new department store/designer scents as they make an appearance; sometimes I like them (John Varvatos Artisan)…sometimes I don’t. This has not been a good spring for me and new releases…of any type! I originally almost wrote a comment like Arvind’s: I was going to beg, “Please, won’t you review something you like a lot if not love — even if it’s an oldie.” But then I realized you did review Artisan recently and you loved some of the D.S. & Durga last week, so it’s ok, I think you’re alternating. I also have high hopes of you when Géranium Pour Monsieur hits the shelves. Natalie: a bad scent can be as “inspiring” as a great one…for sure! lol that makes me want to try it. I’ve already accepted that I have horrible taste. Yeah, the “hosing me down” phrase was very, um, phal — forget it, I’ve changed my mind. Let’s not go there. Krokodil: I was hoping someone would like this and defend it…but I know it’s pretty new and not readily available. May it bring out your inner Oscar! I don’t know… the only time I really like vanilla is in like Black. which smells synthetic… but since it smells like rubber I think that’s kind of the point. I think something like Mugler’s Angel for Men is pretty insane, although I like the shifts from top to heart to drydown in it (especially the sweet chocolate/leather/coffee notes in the middle). That fragrance is like watching angels attacking more than guarding you. I also liked the drydown for La Nuit – to my palate it was like inhaling the scent of fresh linens that have been out in the sun for awhile, very pleasant and not overly vanillic in the least. Krok, your tastes are fine. You are adventurous and open-minded: those are GOOD things. Well it’s time someone took a stand for L’Homme, ha! No, it isn’t groundbreaking or edgy, but since when is that a requirement for a fragrance to be good, I ask? I actually think it is really nicely done, with a light, airy (not to be mistaken for ozonic) quality that doesn’t necessarily have to spell frivolous/cheap. Oh well, more for me then. L’Homme de Nuit I haven’t tried but seriously doubt I’d much care for a sugared version of the original. Dusan: I knew someone out there wore it…it’s in the Top 10 of almost every list of best-selling masculines. I hereby grant you all rights to my share of the L’Hommes! The problem is when you start to have just more than 100 good fragrances, that simply smell good and really don’t add any to fragrance legacy. Why launch them so? Just to make more money. I think that’s the problem nowadays with fragrances, and in this i include l’homme, because it’s safe. It’s rare to see something mainstream edgy, because they are just meant to sell. And it’s a shame to see YSL, that used to dare launch different fragrances, to get in this direction, like all the other great fragrance houses. That’s why I dislike L’homme. Although it’s a good fragrance, it represents a new YSL that I don’t like it at all, that seems to betray its legacy of edgy and trend setter. Kevin, do you think there is some truth to the idea that a perfume composed by committee is inevitably bland? I thought of this reading that L’Homme was composed by three perfumers and that you seem to find it rather tepid. Exist: it’s a SUSPICION that perfume by committee is bland…but most stuff is made by groups these days… I’d love to hear a BLUNT interview with perfumers who work in a group…it must be a difficult gig…but what perfumer would admit it? I will defend the right of anyone to like Yves Saint Laurent L’Homme, but I will also insist that it is one of the most boring, insignificant scents to ever come down the pike. I think when you’ve been seriously wearing fragrance for long enough (I’ve been at it for almost thirty years), when you’ve smelled hundreds and hundreds (and hundreds) of them, then you naturally develop higher standards. You don’t want to smell the same thing every time you heft a new bottle. You want at least a little novelty, the sense that the perfumer isn’t just treading the same old ground. And that is just what L’Homme does. There is not one single thing about it that you can’t smell in a dozen, a hundred other scents on the market right now. It’s perfumery by focus group, a sure path to tedium, repetition, nothingness. This is my latest buy.. and I totally adore it. Giustiano: At last…a La Nuit fan: enjoy! LOL – what a great review! I haven’t sampled La Nuit yet but I did have a sniff of L’homme at a Perfume Empire store and was also disappointed with it’s, in my personal opinion, standard, sleazy guy smell. Sorry no offense intended I’m sure it’s smells great on the right person! But the funny thing was the SA handed me the scent strip with a flourish and announced that this is how “all men should smell” and maybe with that particular grandiose statement I was expecting something slightly, I don’t know, just something different. But I did leave the store thinking that yes, she was somewhat right, but most men DO smell like that anyway – when they choose to wear a scent anyway. I think La Nuit is alright. But it’s just that – alright. I wont be buying a bottle. Just bought La Nuit for someone as a switch from Armani Mania. It smelled great in the store. I have no idea what you smelled. Kierah: Who? Me? I smelled La Nuit de l’Homme, of course! I got pleasantly lured in walking past the YSL counter to try it by a lovelly young sales assistant. Her enthusiasm was admirable and certainly helped me warm to the inoffensive and reasoably cosseting scent. I might like it more, if it cost less or at least the same as my more familar preferred perfumes.